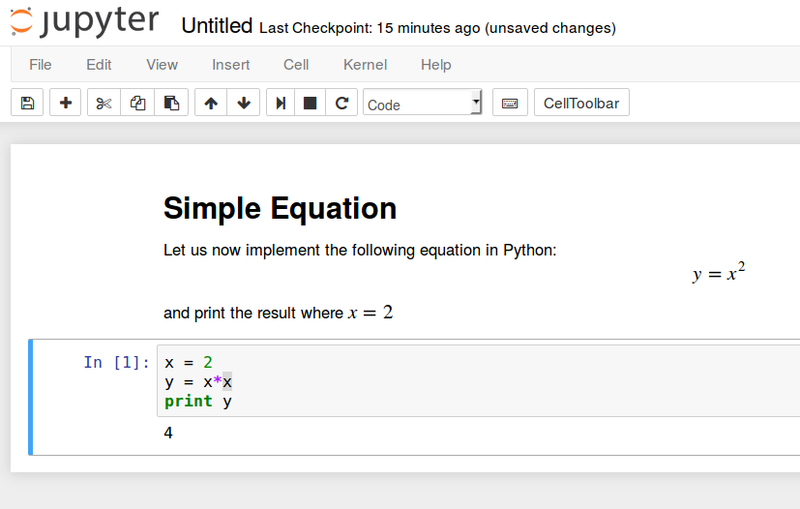 IPython is an interactive command-line interface to Python. Jupyter Notebook offers an interactive web interface to many languages, including IPython. This article will walk you through setting up a server to run Jupyter Notebook as well as teach you how to connect to and use the notebook. Jupyter notebooks (or simply notebooks) are documents produced by the Jupyter Notebook app which contain both computer code (e.g. Python) and rich text elements (paragraph, equations, figures, links, etc.) which aid in presenting reproducible research. By the end of this guide, you will be able to run Python 2.7 code using Ipython and Jupyter Notebook running on a remote server. For the purposes of this tutorial, Python 2 (2.7.x) is used since many of the data science, scientific computing, and high-performance computing libraries support 2.7 and not 3.0+. All the commands in this tutorial should be run as a non-root user. If root access is required for the command, it will be preceded by sudo. Initial Server Setup with Ubuntu 16.04 explains how to add users and give them sudo access. In this section we will install Python 2.7 and Pip. Installing python2.7 will update to the latest version of Python 2.7, and python-pip will install Pip which allows us to manage Python packages we would like to use. Some of Jupyter’s dependencies may require compilation, in which case you would need the ability to compile Python C-extensions, so we are installing python-dev as well. Depending on the latest version of Python 2.7, the output might be different. Similarly depending on your version of pip, the output might be slightly different. In this section we will install Ipython and Jupyter Notebook. To ignore the error, you can press Q and then press Y to confirm. [I NotebookApp] Use Control-C to stop this server and shut down all kernels (twice to skip confirmation). If you are running Jupyter Notebook on a local Linux computer (not on a Droplet), you can simply navigate to localhost:8888 to connect to Jupyter Notebook. If you are running Jupyter Notebook on a Droplet, you will need to connect to the server using SSH tunneling as outlined in the next section. In this section we will learn how to connect to the Jupyter Notebook web interface using SSH tunneling. Since Jupyter Notebook is running on a specific port on the Droplet (such as :8888, :8889 etc. ), SSH tunneling enables you to connect to the Droplet's port securely. If you are using a Mac or Linux, the steps for creating an SSH tunnel are similar to the How To Use SSH Keys with DigitalOcean Droplets using Linux or Mac guide except there are additional parameters added in the ssh command. This subsection will outline the additional parameters needed in the ssh command to tunnel successfully. Now, from a web browser on your local machine, open the Jupyter Notebook web interface with http://localhost:8000 (or whatever port number you chose). If you are using Windows, you can also easily create an SSH tunnel using Putty as outlined in How To Use SSH Keys with PuTTY on DigitalOcean Droplets (Windows users). Finally, click the Open button to connect to the server via SSH and tunnel the desired ports. Navigate to http://localhost:8000 (or whatever port you chose) in a web browser to connect to Jupyter Notebook running on the server. This section goes over the basics of using Jupyter Notebook. By this point you should have Jupyter Notebook running, and you should be connected to it using a web browser. Jupyter Notebook is very powerful and has many features. This section will outline a few of the basic features to get you started using the notebook. Automatically, Jupyter Notebook will show all of the files and folders in the directory it is run from. You now have the ability to include libraries and use the notebook as you would with any other Python development environment! Congratulations! You should be now able to write reproducible Python code and notes using markdown using Jupyter notebook running on a Droplet. To get a quick tour of Jupyter notebook, select Help > User Interface Tour from the top navigation menu.